Split Bamboo Fly Rod | Crafted by F. D. Kretchman Rod Co.
Hand made. One at a time. The F. D. Kretchman Rod Co. started in 1993 and today crafts the finest Split Bamboo Fly Rods. Each one is carefully hand-made, one-at-a-time, to meet the desires of the most discriminating fly fishers. We also perform the highest quality repairs & restorations on fine antique rods. Professional appraisals of your rod and tackle collection are available too. In addition, we write all the rod descriptions for Lang’s Antique Tackle Auctions and have done so since 2005. I craft each rod individually, using a combination of special tapers, carefully selected bamboo, heat-tempering, flaming, and waterproof glue, to create a fly rod that will cast like a dream in the fisherman’s hand. Learn about our selection of fresh water split bamboo fly rods. From our Classic, to Signature, to Presentation grade, we can build the right rod for you. Located in the historic Town of Kittery Point, Maine, our shop is situated only 300’ from salt water. Listen to the sounds of fog horns and lobster boats as you craft your own personal bamboo fly rod. 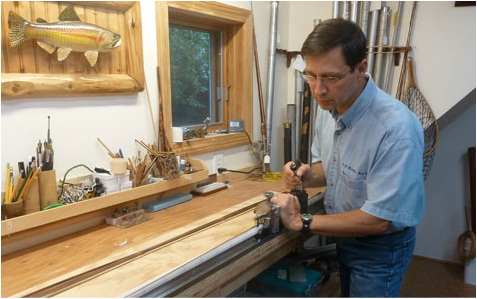 Each of our fly rods is hand built by master builder Fred Kretchman. Learn more about our process from choosing the right culm of bamboo to finishing our fly rods for a lifetime of use. In 1999, I was selected by a committee of the prestigious Smithsonian Institution in Washington, D.C. to represent the state of New Hampshire at their annual Folklife Festival. Since they only feature one state per year, this was a once-in-a-lifetime opportunity. For 2 weeks, I demonstrated my rod making skills on the Mall, in front of the Capitol Building. This event culminated on the Fourth Of July. The attendance was estimated at 1.3 million visitors. What an amazing honor to be chosen by the Smithsonian for this event. To the best of our knowledge, no other bamboo rod maker has been chosen by the Smithsonian Institution for this honor. The following Summer, the State of New Hamphire re-created this event at the Hopkinton State Fairgrounds. For 5 days I demonstrated my skills for tens of thousands of attendees. Kretchman featured on WCSH TV program "207"
See the Blog dated 4/24/14 on this web site for the video featuring us on WCSH channel 6 program "207". One of the co-hosts, Kathleen Shannan, is an avid fly fisher. This year, 2018, marks the 25th year that we have been making bamboo fly rods! A lot has changed over the years, but our dedication to building the highest quality rods has never wavered. Early rods were solidly built but now the emphasis is moving toward more hollow-built models. There are obvious reasons for moving into this direction: Hollow bamboo fly rods are lighter in the hand, yet stronger than you might think. There are many ways to hollow out the inside of the bamboo shafts, but we have settled on the process of using "dams" inside the rod sections to preserve the strength and integrity of the rod. Just making a hollow 'tube' of bamboo (which is a common method used by other rod makers today) is inherently weak and will lead to failure before long. Our method of hollowing also allows us to make longer rods for use on salmon and in salt water fishing. Combining longer hollow rods with 2 handles results in powerful rods that are much easier to cast than a single-handed rod. In October of 2018, Fred hooked and landed 6 landlocked salmon in 2 days of fishing. Four of these fish were in the 5-6 lb. range with one jumbo weighing over 6 lbs. All were caught on our 9' 5-wt. hollow model P-206. With each passing year, our workshops gain in popularity. Most "students"are seeking to build their first bamboo fly rod, but we are seeing an increasing number of students who have taken a workshop elsewhere and are turning to us for a more advanced level of craftsmanship. One recent student this Fall traveled from South Africa so he could hone his skills in using the Morgan Hand Mill as well as other aspects of this craft. See the 'Offerings' section of our site for details on this wonderful experience and contact us to schedule your class. It is gratifying to hear from so many of our customers who think our rods are at least equal to, if not better than any other rods made today. While we appreciate these compliments, we still are striving to innovate where-ever we can, and to continually offer only the highest quality rods. As we look forward to the years ahead, we hope you'll join our many friends who fish their Kretchman rods and make memories on the water. Tight lines!